Phillip England, Sarah Mashman as Mata Hari & Michael Bugelli, proprietor of Michael Bugelli Galleries, 2017. Diptych of 5 x 7 inch collodion tintypes. 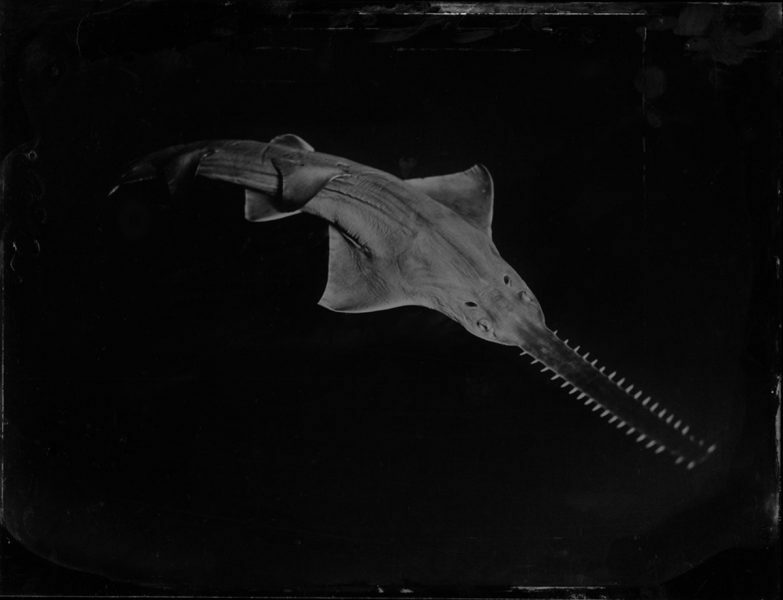 Phillip England, Pristis pristis (Freshwater Sawfish) CSIRO H 2755-01. Collodion tintype, 2016, 8.5 x 6.5 inches. Phillip England made these photographs of specimens from the Australian National Fish Collection (ANFC) while undertaking an artist in residence placement at the Hobart CSIRO Marine Laboratories. Phillip England, Bathyraja maccaini McCain’s-Skate) CSIRO-H-855-01. Collodion tintype, 2016, 8.5 x 6.5 inches. Phillip England made these photographs of specimens from the Australian National Fish Collection (ANFC) while undertaking an artist in residence placement at the Hobart CSIRO Marine Laboratories. Phillip England, Eucrossorhinus dasypogon (Tasselled Wobbegong) CSIRO H 7768-01. Collodion tintype, 2016, 8.5 x 6.5 inches. 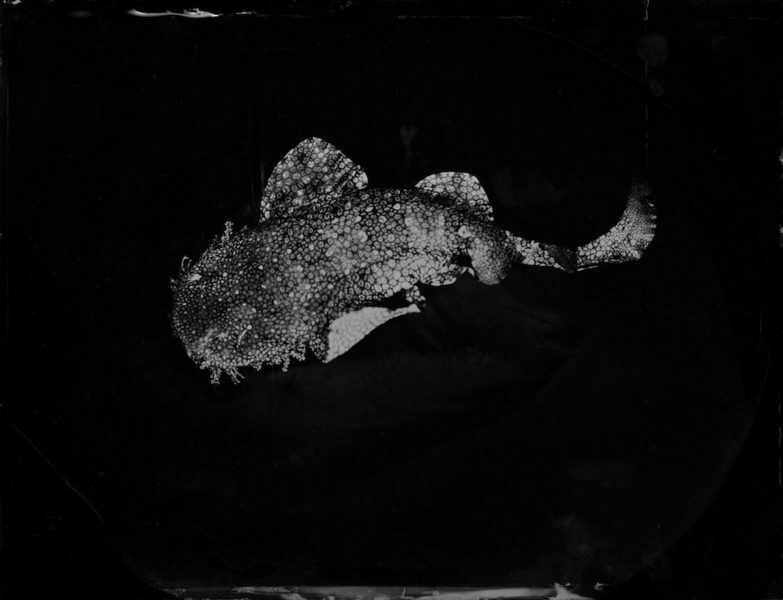 Phillip England made these photographs of specimens from the Australian National Fish Collection (ANFC) while undertaking an artist in residence placement at the Hobart CSIRO Marine Laboratories. Phillip England, Galeocerdo cuvieri (Tiger Shark) CSIRO H 3351-01. Collodion tintype, 2016, 8.5 x 6.5 inches. 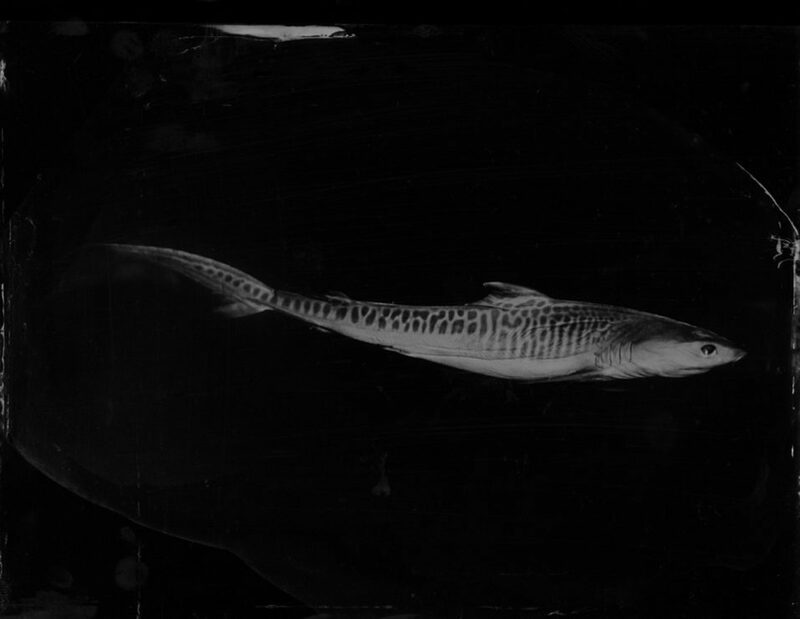 Phillip England made these photographs of specimens from the Australian National Fish Collection (ANFC) while undertaking an artist in residence placement at the Hobart CSIRO Marine Laboratories. Phillip England, Gymnothorax isingteena (Spotted Moray) CSIRO unreg. Collodion tintype, 2016, 8.5 x 6.5 inches. 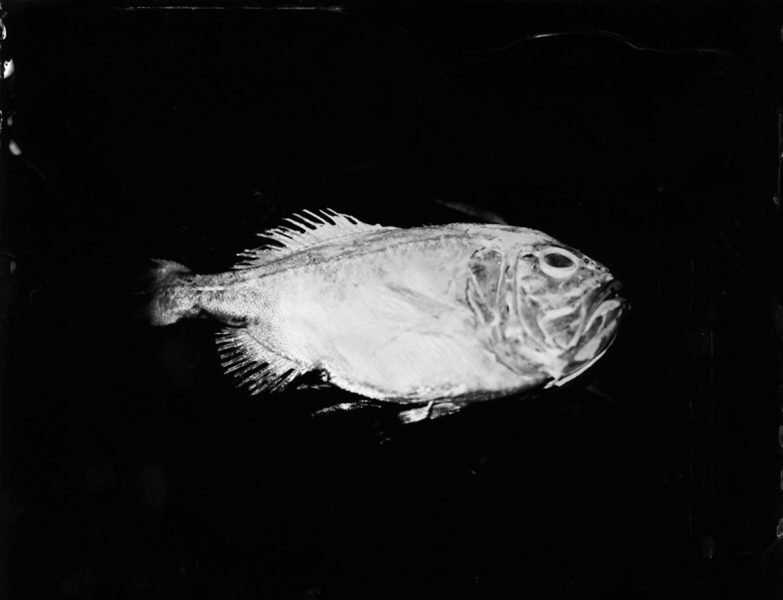 Phillip England made these photographs of specimens from the Australian National Fish Collection (ANFC) while undertaking an artist in residence placement at the Hobart CSIRO Marine Laboratories. 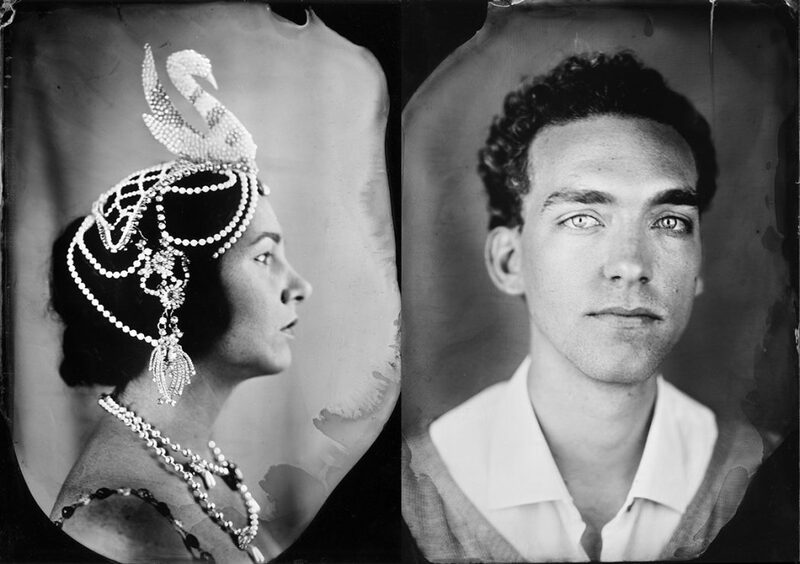 Hobart-based photographer Phillip England is one of a handful of artists currently using the antique process of tintype photography to create contemporary portraits. A technique developed in the 1850s, tintype photography evolved from the daguerreotype, a more labour intensive form of photography involving long exposure times and head braces on posing stands. As the advancements of the Industrial Revolution surged forward the materials needed for photographic techniques quickly became accessible and inexpensive, allowing the tintype to become readily available to the general public. Proving more portable than the daguerreotype, tintypes released photographers from the confines of the studio and allowed them to travel outdoors and on location. Often included as a novelty at fairs and carnivals where sitters were photographed in front of painted backdrops, the tintype paved the way for the possibilities of modern photography. In the age of digital photography the tintype is striking in its visual difference and slow, hands-on making process. 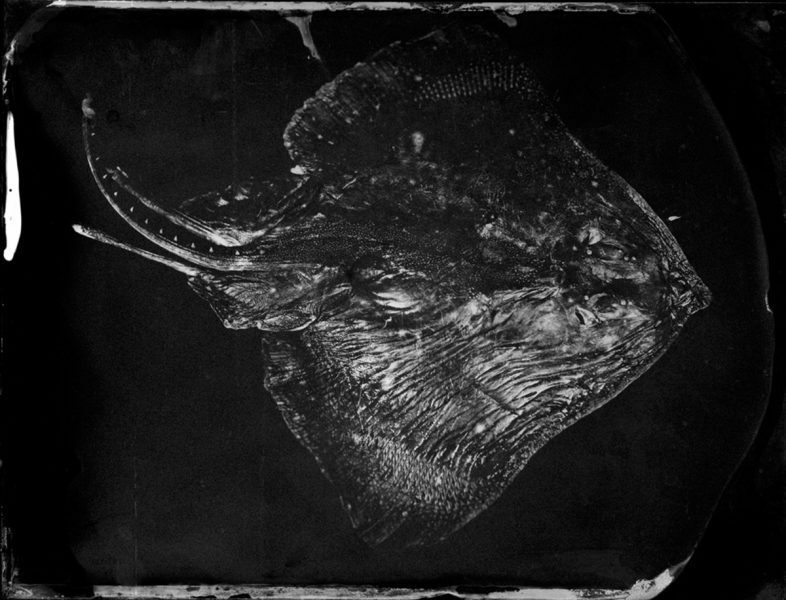 Processed entirely by hand, the tintype image is exposed directly on to a metal plate resulting in a photograph that is more like an object than an image. Like the keepsake miniature portraits exchanged between lovers in the 1700s, it is this handcrafted element that separates the tintype image from modern, multiple snapshot culture in which the instant selfie is king. Phillip England is a former population geneticist with the CSIRO. He took up photography five years ago and most of his images are produced with a large bellows camera. England works predominantly in the portrait style and his frequent exhibitions often feature prominent Tasmanian musicians, performers and artists. Phillip England, Hoplostethus atlanticus (Orange-Roughy) CSIRO-H-7291. Collodion tintype, 2016, 8.5 x 6.5 inches. 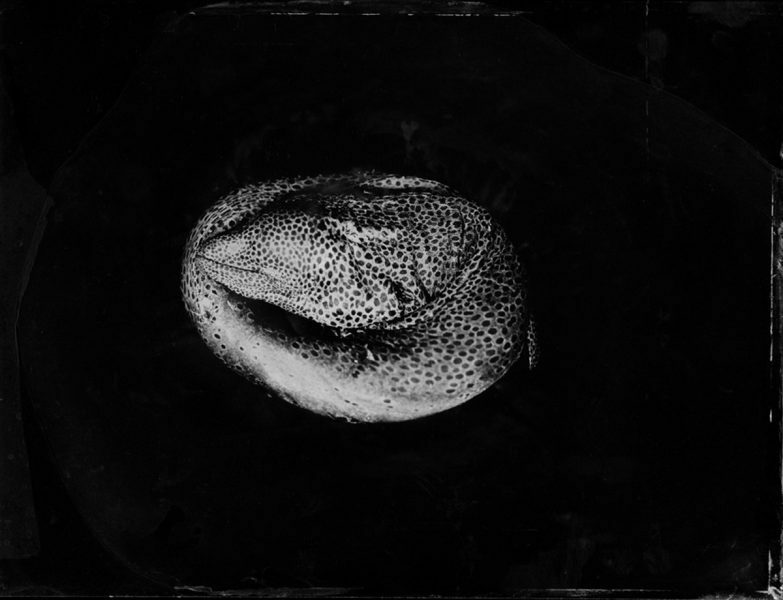 Phillip England made these photographs of specimens from the Australian National Fish Collection (ANFC) while undertaking an artist in residence placement at the Hobart CSIRO Marine Laboratories. England’s exhibition Ag/BLACK: Antique Process Portraiture in the Selfie Age is a compact installation that can be viewed as an intermission between two larger exhibitions by the artist: Fragile Bounty from November last year and the upcoming Denizens. Situated in the snug confines of the Lightbox at the Salamanca Arts Centre, Ag/BLACK features a series of portraits tucked in and around a deep shadowbox frame lined with red fabric. Strings of pearls spill from the base of the cabinet and a nearby music stand holds yellowed pages of sheet music. England’s artist statement reveals that some of the sitters in his Ag/BLACK portraits are associated with A Tasmanian Requiem, an upcoming performance at Hobart’s Theatre Royal featuring music and visuals illustrating the legacy of the Black War of Van Diemen’s Land. Other portraits include art dealer Michael Bugelli, painter Elizabeth Barsham and radio producer Sarah Mashman. As the title suggests, in Ag/BLACK the images are silver and black. The unpredictable nature of the silver collodion solution that coats the metal plate lends a distinctive depth that appears tactile and dramatically lifelike. The texture created by fine silver particles and the contrast of darkness and light also adds a theatricality to the portraits which is further enhanced in the Lightbox by England’s chosen props. There is a sense of Victorian glamour in the portraits. With their dark and moody facades, they seem to have just resurfaced after being secreted away in a great-grandmother’s glory box. There is an appealing mix of history and modernity in England’s portraits and it illustrates why the renewed interest in tintype photography has been brewing for some time. In 2015, fashion and lifestyle photographer Victoria Will created a spectacular series of celebrity tintype portraits at the Sundance Film Festival. Elsewhere, Los Angeles-based artist Ian Ruhter built his own camera in the back of a van to capture vast landscapes on huge 1.5m wide tintype plates. While the current use of tintype does not venture far from portraits and landscapes, it is thrilling to imagine the potential of this medium when pushed further into the sphere of contemporary art. 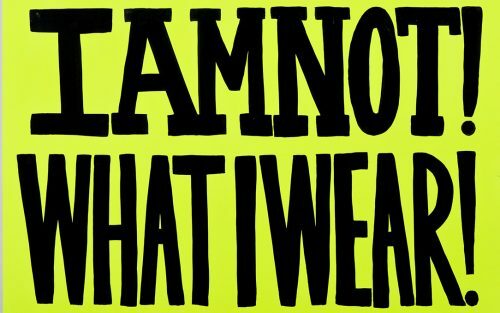 Doley’s 95 Things Learnt About Feminism are evidently not intended as a complete definition, if such a thing can even be attempted, but rather a snapshot of how the movement exists today: ever-shifting, many-layered, but stronger than ever. Practice makes perfect, but that doesn’t make it any easier. 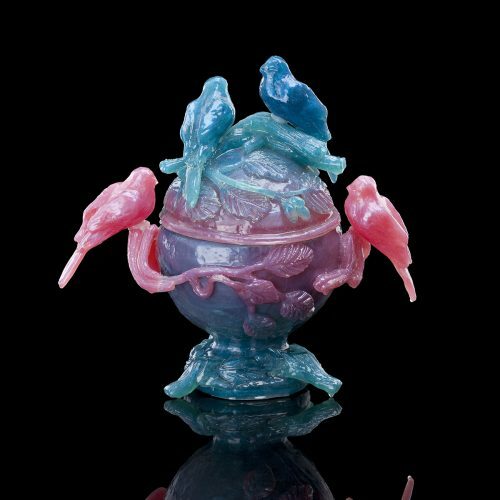 Kate Rohde has spent the past 10 years or so honing what she has described as a “hyperactive” practice.